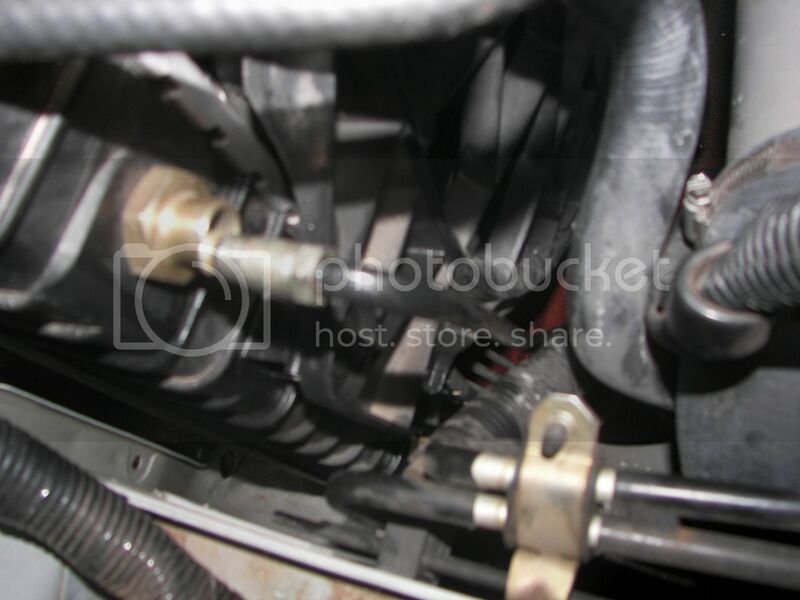 The following is the method I used to install my transmission cooler. 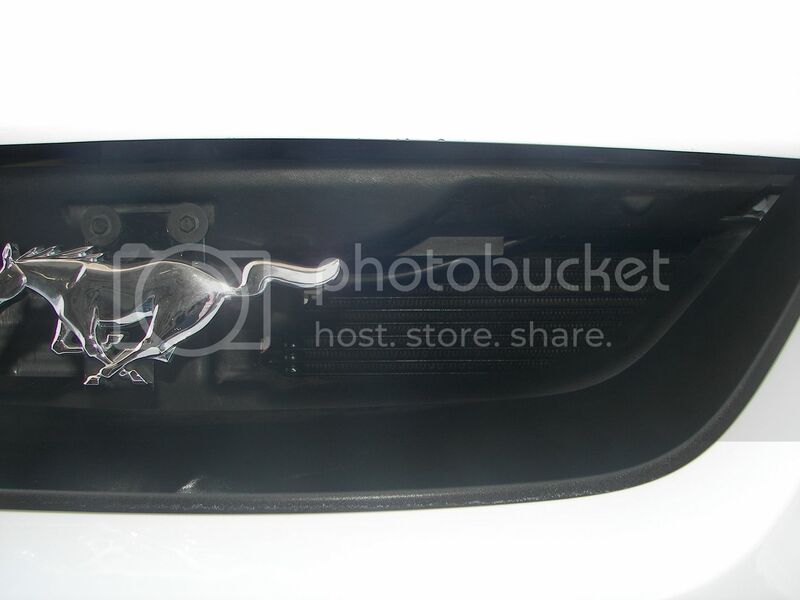 There are many variants and methods explained online, but few specific to 4r70w's in SN95 and New Edge Mustangs. Hopefully, this will be of use to those, such as myself, who are not experts in trans tech. The main cause of transmission failure is excessive heat. Anytime you start throwing more power at a stock trans you are increasing temperatures. In preparation for installation of my stall converter, I decided to install a trans cooler. There are a plethora of options when it comes to selecting a trans cooler. First off, which style is best? The general consensus is that stacked plate trans coolers are more efficient than the tube and fin styles. If you are going to go through the trouble of installing one, you might as well get the most effective. Second, which size is best? Rule of thumb dictates that you should get the biggest one you can fit in your particular application. 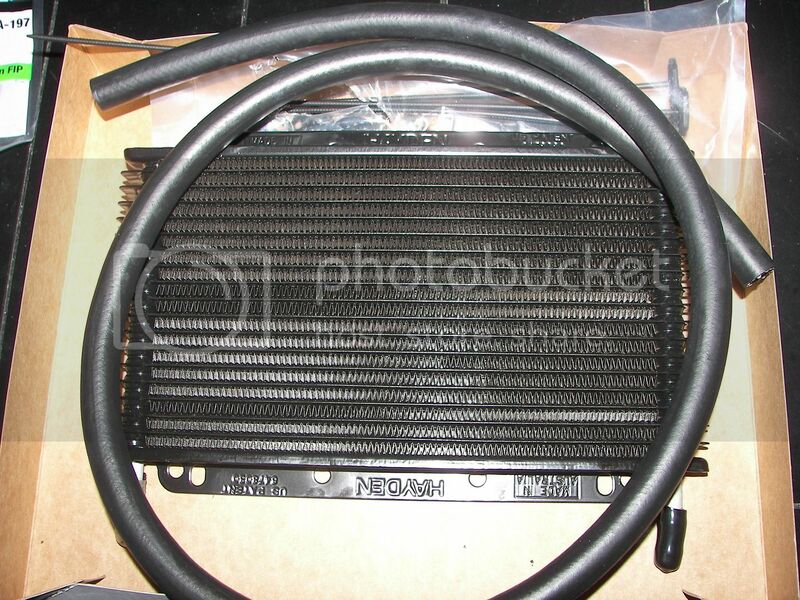 The best place to mount your trans cooler is where it will receive ample air flow. In front of the radiator, in a grille opening or in a foglight opening are some good options to consider. In some applications where room is an issue, you can "dope" mount the cooler. This means to mount the cooler flat like a book laying on a table. This does reduce the efficiency but is still better than no cooler at all. For mine, I chose a Jeg's XHP trans cooler. It has a 20,000 GVW with the stacked plate style and measures 11"x7.5"x3/4". The cooler is stamped with the Hayden logo, so I guess it's just rebranded as Jeg's. I am running a decent sized Treadstone front mounted intercooler so this was about as big as I could go without running into clearance issues. 1. Remove the headlights and front bumper cover. I also opted to remove the battery and battery tray to open things up a bit. A good write up can be found here:[url=http://www.fnsweet.com/garage/fascia/index.shtml [front facia removal FnSweet[/url] This will make your life easier and help you determine a location for the cooler. 2. Attach the rubber hoses to the cooler, secure them with clamps and mount the unit. 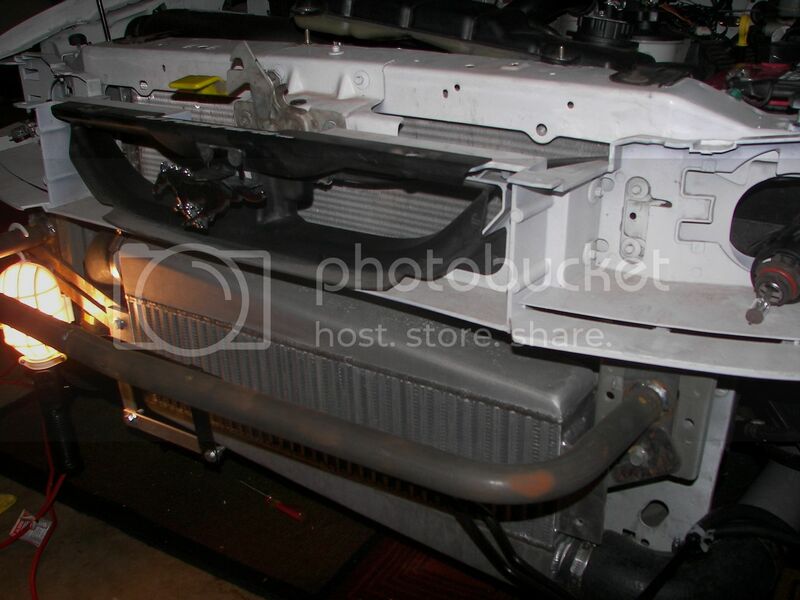 I decided to mount the cooler behind the grille, above the FMIC. The kit comes with zip ties you run thru the radiator and A/C condenser. Throw them away and hard mount it with some sheet metal screws. 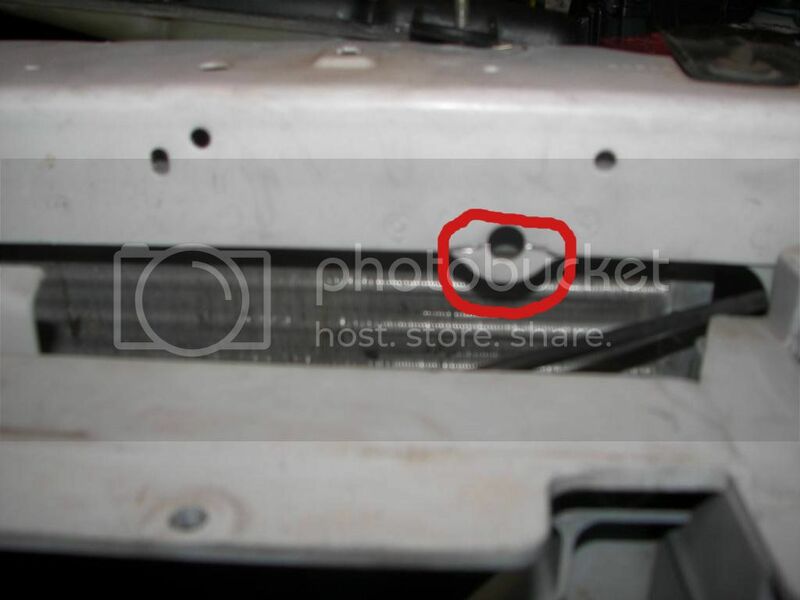 To get the cooler to sit straight, I had to dremel-off the tab circled in red. I also needed the cooler to clear the hood latch cable. 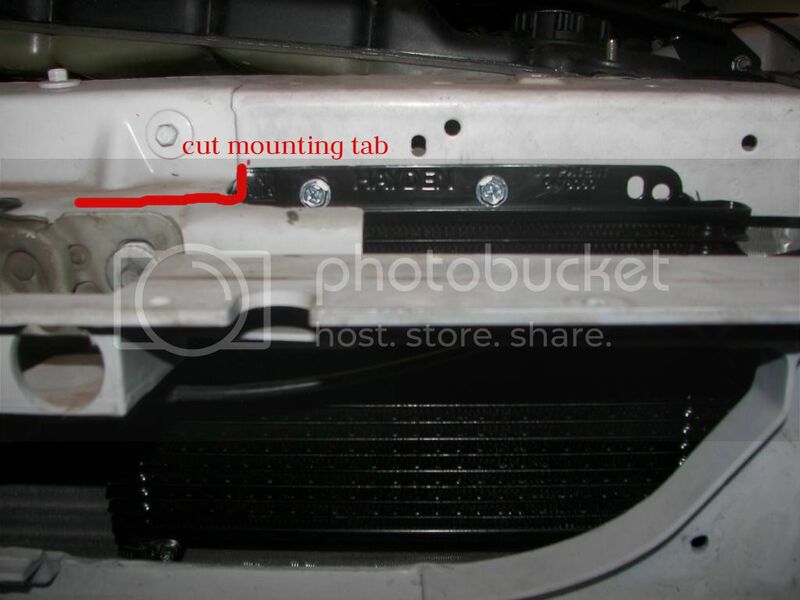 To do this, I notched the mounting tab on the cooler to move it more towards the passenger side which also placed more surface area into the grille opening. 3. Mark your holes and drill. Be careful not to puncture the condenser as it is approx. 1 inch behind this mounting surface. Also make sure your screws are short enough not to pierce the condenser. By mounting on this surface, the fluid tubing sit about 1/2" away from the condenser - a good thing. 5. Slide one end of hose over the flare and secure it with hose clamps. 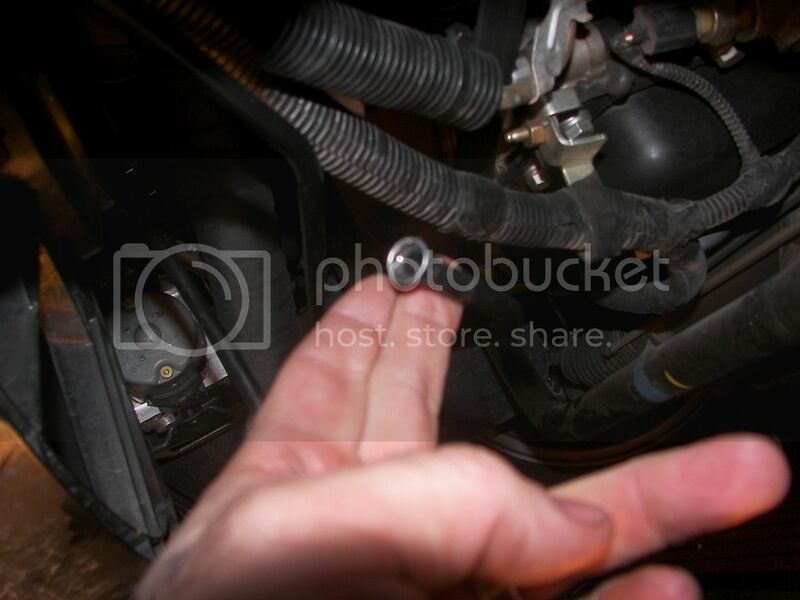 Screw the connector back into the radiator. 6. Get underneath the car and follow the line you cut. I took about 8" out of the middle of the line to avoid having any extreme bends in the tubing. Locate the remainder of the steel return then cut and flare the ends. There should be plenty of room to use your cutter and flaring tool. You may lose a little bit of trans fluid so have a rag handy. 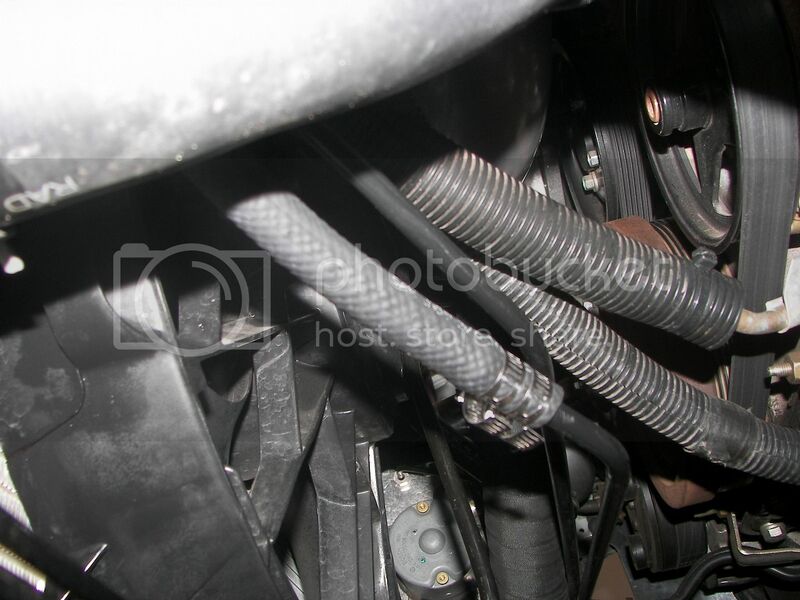 Attach the remaining hose and secure it with 2 hoseclamps. Tie up any hanging lines and make sure they are not rubbing any sharp edges. 7. Check over all connections and reinstall the battery. Start the car, let it warm up then run through the gears a few times. Check for leaks. If you are good to go, reinstall the front bumper. Take it for a test drive and then check for leaks again. I went out beat on my car pretty good and all lines and connections remain solid and leak free. After installing the converter and getting a retune, I will post trans temps via datalog. As I said before, there may be different ways to accomplish this install but this one worked for me and was super easy. If you have any questions, pm Shelbydog! Today 05:05 PM by dr.gonzo!